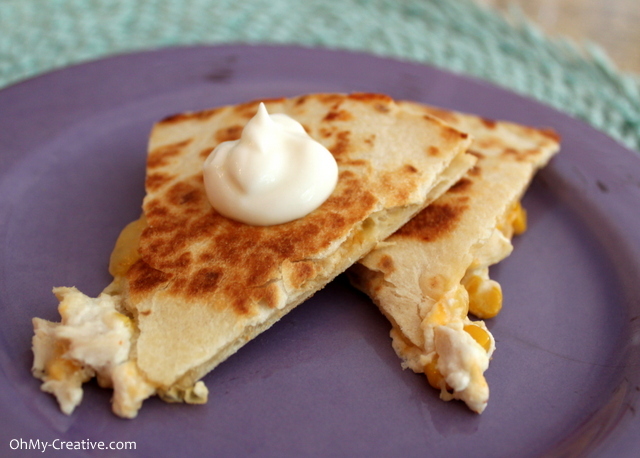 These Chicken Quesadilla with Goat Cheese & Corn Salsa has become one of my families favorite dishes. Highly requested and devoured in minutes…they are so easy! This also makes a great appetizer! Goat cheese – 6-8 oz. I buy a double large package at Costco and freeze half. I use about half of one large package. Tip: Goat cheese quickly becomes very soft and crumbles better when it is cold. It is a good idea to keep it in the refrigerator while making each quesadilla. Also, I have bought the Corn Salsa at Trader Joe’s and recently found this Spicy Corn Relish at my local grocery store in a specialty food department. If you can’t find it where you live, I will tell you how to make your own at the bottom of this post. Cook and chop the chicken. Spray a non-stick skillet with cooking spray and place one tortilla in the pan. Layer all of the ingredients equally. The shredded cheese acts like glue to hold the quesadilla together, so I place some on the bottom of the tortilla and then on top of the other ingredients before adding the top tortilla. 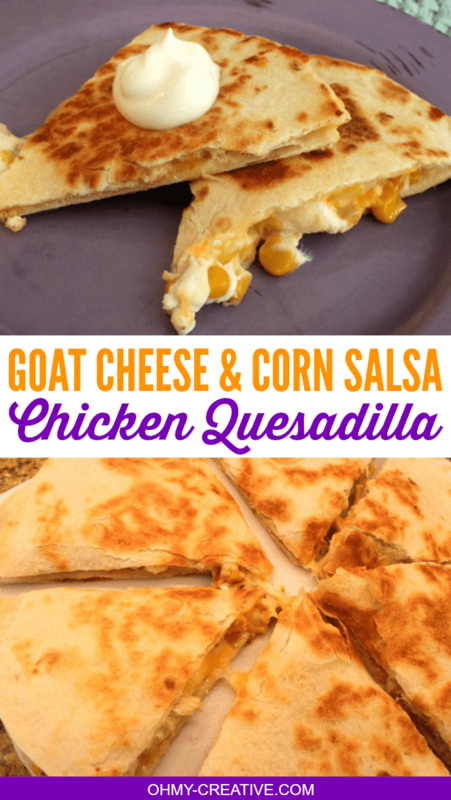 The goat cheese melts, but it will not hold the quesadilla together. Once the bottom is browned, I flip it over to let the top cheese melt – cut and serve! Yum! If you are unable to find the corn salsa or relish here is how you can make something similar. Chop one medium onion and brown until soften in a non-stick skillet. Toss in approximately a half a bag of frozen corn. Mine is usually thawed by the time I add it to the skillet – brown a little. Drain the liquid out of a can of Old El Paso Green Chilies and divide the amount in half. Mix half of the can in with the onions/corn and place the other portion in a bag and freeze for next time. Warm through and add this to the quesadillas as I did the corn salsa! Goat cheese - 6-8 oz. I buy a double large package at Costco and freeze half. I use about half of one large package. Tip: Goat cheese quickly becomes very soft and crumbles better when it is cold. It is a good idea to keep it in the refrigerator while making each quesadilla. Also, I have bought the Corn Salsa at Trader Joe's and recently found this Spicy Corn Relish at my local grocery store in a specialty food department. If you can't find it where you live, I will tell you how to make your own at the bottom of this post. Once the bottom is browned, I flip it over to let the top cheese melt - cut and serve! Yum! Chop one medium onion and brown until soften in a non-stick skillet. Toss in approximately a half a bag of frozen corn. Mine is usually thawed by the time I add it to the skillet - brown a little. Drain the liquid out of a can of Old El Paso Green Chilies and divide the amount in half. Mix half of the can in with the onions/corn and place the other portion in a bag and freeze for next time. Warm through and add this to the quesadillas as I did the corn salsa! DELICIOUS!! I happen to have all the ingredients! Might just make this for supper! These look yummy! Is there a story behind your spelling of quesadilla? They are – thanks for commenting! Gosh, these looks SO delicious! Thanks so much for sharing your recipe with us. I saw this post as it was featured at “Carolyn’s Homework”. They are delicious – you must give them a try! Mmmmm……! It looks yummy-er than I can say! Thank you for the recipe, you make it sound so easy that I might try it myself (I’m a beginner cook). They are rather simple to make – you won’t be sorry!